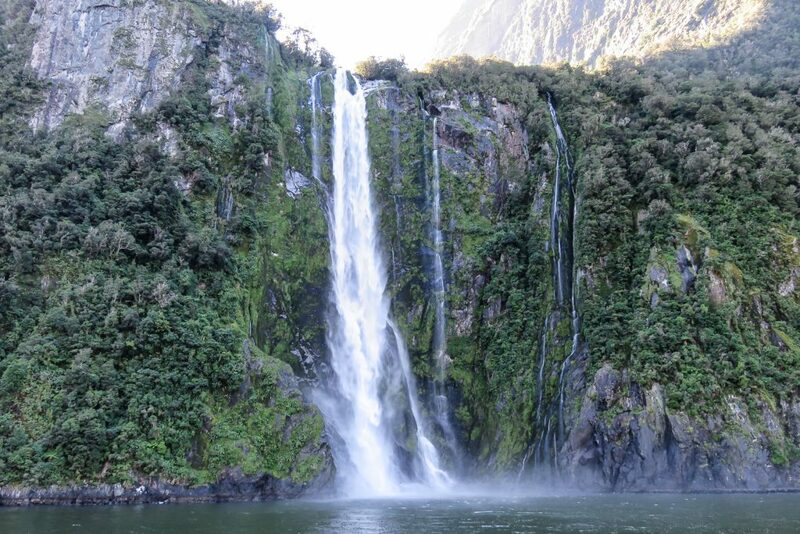 A cascading waterfall thunders beside you as the boat cruises along the rocky cliffs in the magical Milford Sound. Lush green forests that border the clifftops become obscured by the shimmering mist and icy spray from these beautiful waterfalls. Surveying this spectacular scenery from waters edge to mountain peak leaves you with a feeling of wonder. Milford Sound is a wondrous natural beauty that is found on New Zealand’s South Island. At first sight, you may not think much of Milford Sound’s inlet, but once you pass between the rocky precipices you will see that it opens up into an extraordinary expanse of water. Tucked away along the South Island’s west coast, you’ll have the chance to explore a landscape of such mesmerising beauty it appears almost otherworldly. While taking a tour of New Zealand, a Milford Sound cruise should be at the top of your South Island itinerary. The lush green forest intermingling with cascading waterfalls and mottled cliff faces sets the bar high in terms of natural beauty. 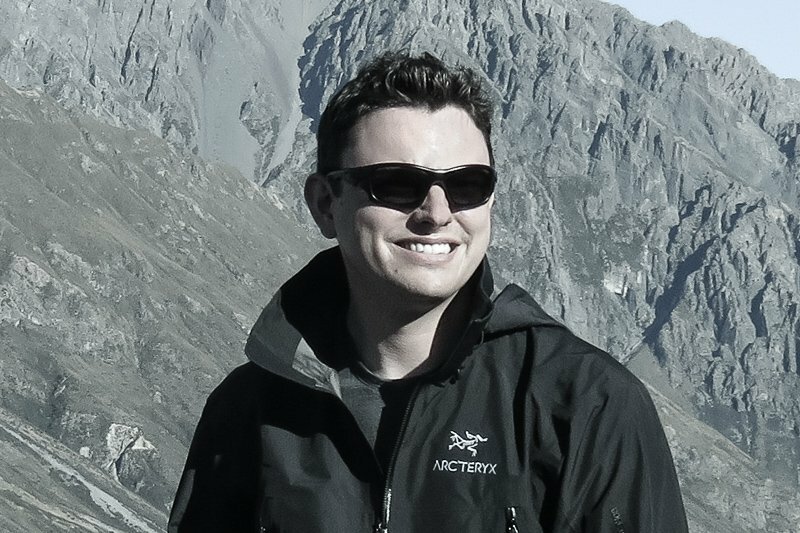 Read more about my journey to explore New Zealand as I travel the world as an Airline Pilot. The seemingly endless stream of water flows steadily down the cliff. You watch as a haze rises from the water, spraying off the rocks and filling the air with moisture. The sun rises behind you, and while its warmth touches your back you see the waterfall refracting a rainbow in the sunlight. The first thing to take into account when planning Milford Sound tours is how you’re going to tour the landscape. You have several options, you could hike, cycle, kayak, sail or treat yourself to a scenic helicopter flight. 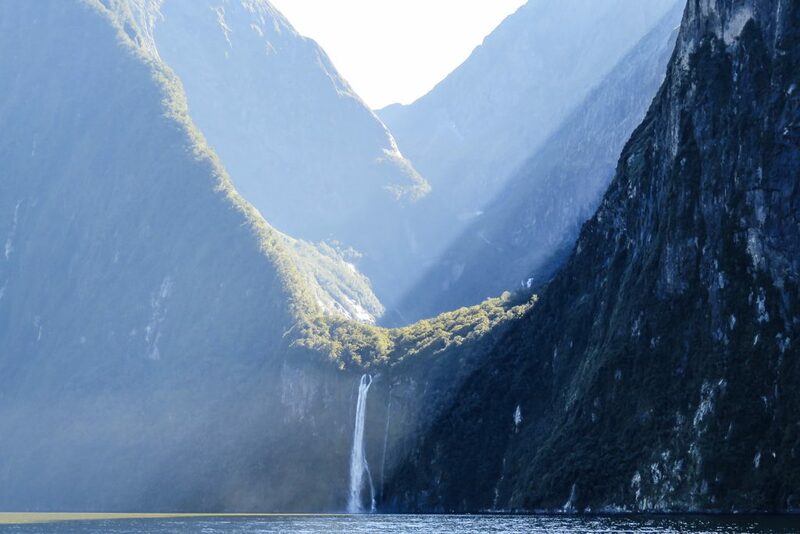 Viewing Milford Sound by boat is one of the most popular ways, but avoid the large boats as they’ll be overcrowded and you’ll miss out on the serenity of the cruise. After rainfall, the lush green forests that cling to the mountainside are adorned with a number of fine waterfalls which flow from the steeper areas. Sailing through Milford Sound will give you incredible views of not only the landscape but, if you’re lucky enough, the wildlife too. Seals and dolphins are sometimes found playing in the glistening water. This will give you a real appreciation for the untouched beauty of New Zealand’s South Island during your Milford Sound cruise. 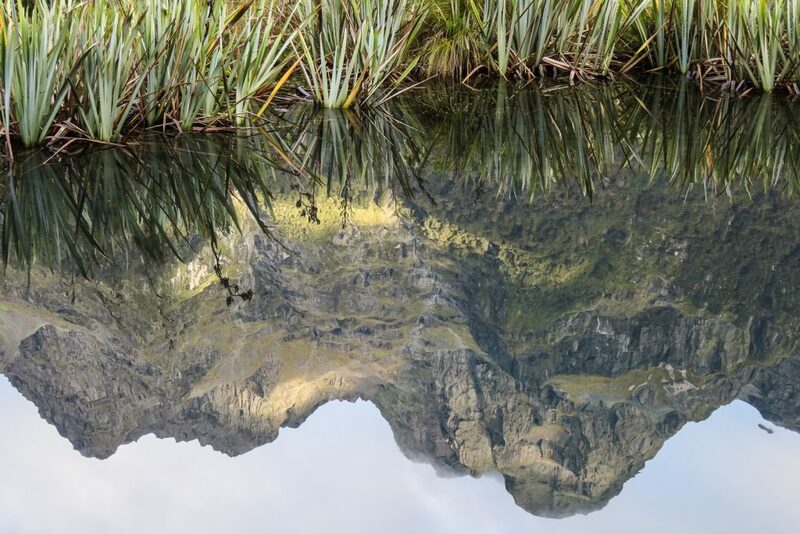 Mitre Peak is Milford Sound’s centrepiece, and will be a significant summit during your Milford Sound tour. A very unique and distinctive mountain that provides an impressive backdrop to many of Milford Sound’s beautiful scenes. The moment you set off on your boat trip you will have an excellent view of this spectacular summit, and throughout the cruise, you will see it from a number of different and interesting angles. Mitre Peak is so named because of the shape of its summit which resembles the mitre headwear of Christian bishops. At least this is what John Lort Stokes thought when he first set eyes on it while aboard his ship, the HMS Acheron in 1851. 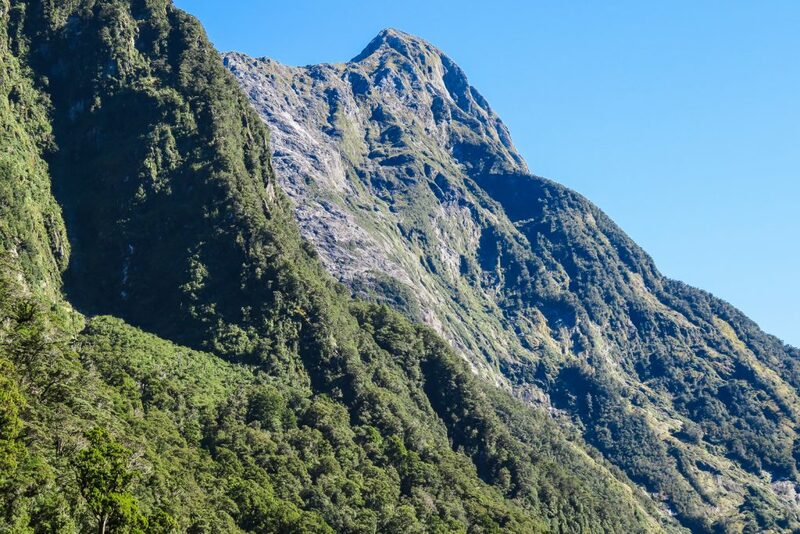 At a staggering 5540 ft, Mitre Peak is Milford Sound’s most prominent mountain. Towering above its surroundings, Mitre Peak has become one of New Zealand’s most photographed mountains. This will come as no surprise when you stare up at the incredible mountain, coated with dappled green forests and a number of glorious waterfalls. 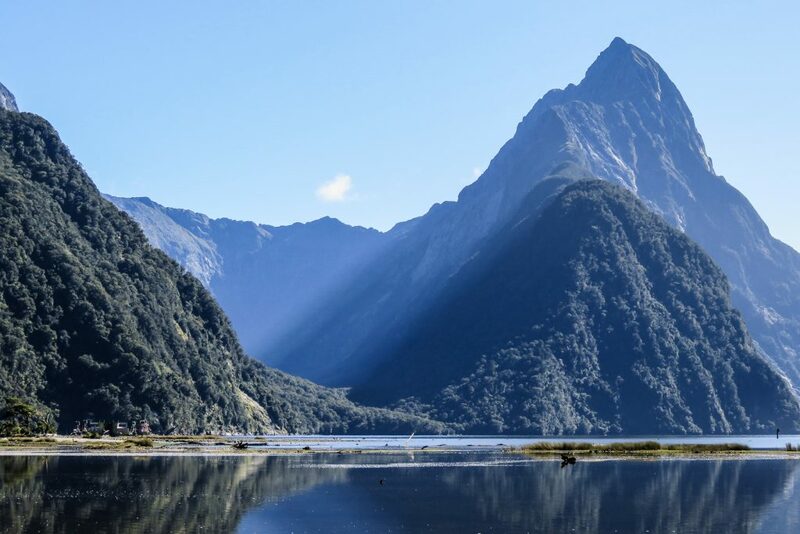 This view is a clear indicator of why Milford Sound tours display unfailing beauty. A cold morning light is cast through the mist, softly illuminating your surroundings. The rain pours down in an endless torrent, drenching the entire landscape. As quickly as it had started, the rain subsides and the mist clears. The sun’s rays flood the valley and you’re left speechless as you watch waterfalls sprouting across the mountainside. Milford Sound is the wettest inhabited place in New Zealand, and one of the wettest locations in the world. Up to 252 inches of rain each year sustains the expansive growth of vegetation in this region. While the trees may thrive in these wet conditions, the heavy rains often uproot many of them. This can cause a landslide of trees and earth as the ground becomes loose when the roots lose their grip. The rain does not only bring this lush forest to life, it also coaxes a number of temporary waterfalls to flow from the cliffs. 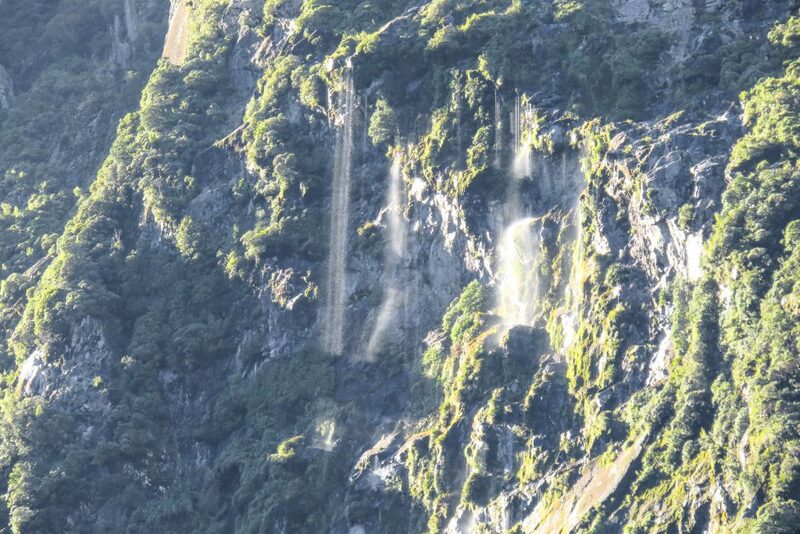 Some of these waterfalls can reach up to 3280 ft in length and mostly have very thin streams of water. Milford Sound was originally thought to be a fjord because of its thin entrance. A fjord is a narrow inlet that flows from the ocean between two mountains or high cliffs. A sound is simply a wide fjord, with the body of water spreading a lot further between each mountain. Milford Sound is in the region known as Fiordland. The area was named this because of its geographical features, and it comes from the Scandinavian word ‘Fjord’. During your Milford Sound cruise, you will travel out into the ocean and do a small loop around St Annes Lighthouse. This is where Milford Sound meets the Tasman Sea and will be the furthest point during your cruise. The inlet of Milford Sound is so narrow that early European explorers who travelled here initially overlooked it. They could never have guessed it was harbouring such vast bays. Milford Sound itself runs 15km inland from the coast and plays host to a number of incredible sights along the way. Some of the most spectacular of these sights are the waterfalls that can be seen spotted along the cliff faces. Bowen Falls and Stirling Falls are among the biggest and most impressive waterfalls. Both of these waterfalls flow all year round and are not temporary like many of the others. 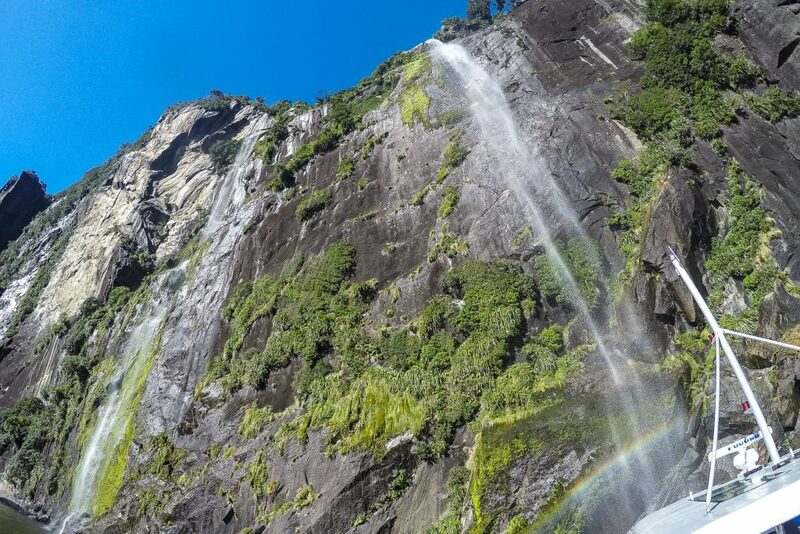 On Milford Sound’s northern side, you are treated to the incredible view of Stirling Falls. Rounding a corner in the mountainside you will have a spectacular view of the falls thundering into the water below. The powerful sound that resonates from these falls and the mist that rises from its foot make for a truly profound experience. Stirling Falls is just one example of how truly ‘otherworldly’ this landscape can be. The gentle curve of the cliff faces on either side both running down to meet the falls in the middle creates a scene that’s almost too good to be true. At a height of 495 ft, this picturesque sight is a wonder to behold. Just one of the many advantages that comes with booking a smaller boat cruise, rather than joining one of the larger boats, is that you are able to come a lot closer to these incredible waterfalls. The Stirling Falls, in particular, are fantastic to see up close. The spray fills the air around you and you may even be lucky to spot some seals which can often be found lying about on the rocks nearby. The fantastic terrain surrounding this waterfall offers an incredible view of the otherworldly landscape. From the flow of the mountain ridge to the stunning waterfall, Stirling Falls sets the bar high for natural wonders. The lush vegetation that clings to the rock frames the white cascading water of the falls. The experience of viewing this waterfall up close gives you a real sense of being surrounded by nature. The engine growls to life and the seat beneath you trembles as the helicopter blades begin to spin. As you lift off the ground, your heart begins beating with excitement. The higher the helicopter rises, the more the surroundings open up in front of you. The aircraft crests the mountain ridge and the impressive expanse of Milford Sound laid out before you. There’s nothing quite as breathtaking as viewing a natural landscape from above. The curves of the mountain become more apparent. With the sparkling water below you, the sensation of flight creates an unforgettable experience. 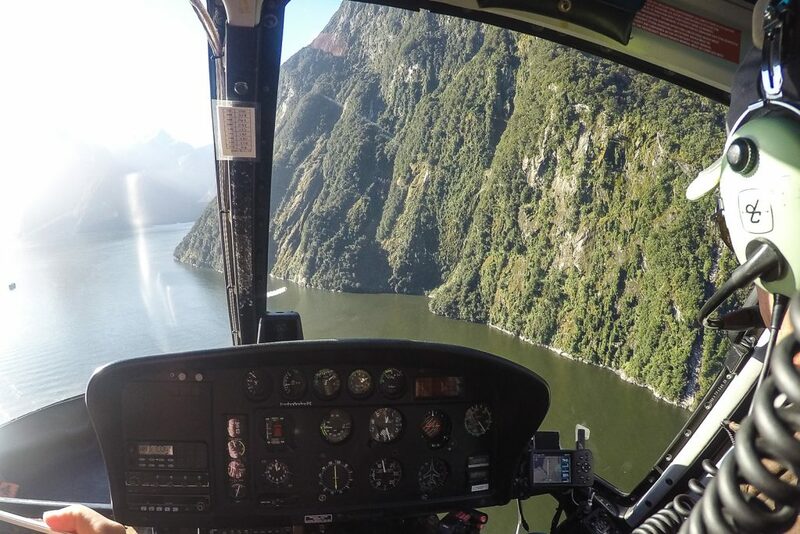 The moment that I realised how fortunate I was to be doing a Milford Sound cruise on a sunny day, I knew I had to book a helicopter tour as well. Since Milford Sound is one of the world’s wettest regions, sunny days are scarce and highly sought after. To view this fascinating landscape from such a unique perspective on a clear day is truly something special. During my incredible journey to explore New Zealand’s South Island, I experienced a number of truly awe-inspiring activities, but few match up to the feeling of soaring above this landscape. Watching the way that the scenery changed as the helicopter soared over this unique geography was truly magnificent. The wonder of flight is something that fascinates me each time I lift off the ground. It really is incredible how something as large and heavy like a helicopter can soar through the skies. 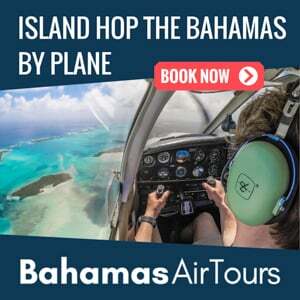 To sit aboard an aircraft and enjoy a scenic flight through a new terrain is the perfect way to combine my two passions of flying and travel. After exploring much of Milford Sound, I had the chance to set foot on the glacier at Mount Tutoko. Read more about New Zealand Travel our New Zealand Travel Guide. Looking ahead I saw a man walking toward me carrying a bin bag. I peered curiously at the bag, and as I did a white alien tentacle flopped out the side, dangling beside the man’s legs. As if Milford Sound is not surreal enough already, Ridley Scott was in the process of filming ‘Alien Covenant‘ during my visit. New Zealand is no stranger to Hollywood. 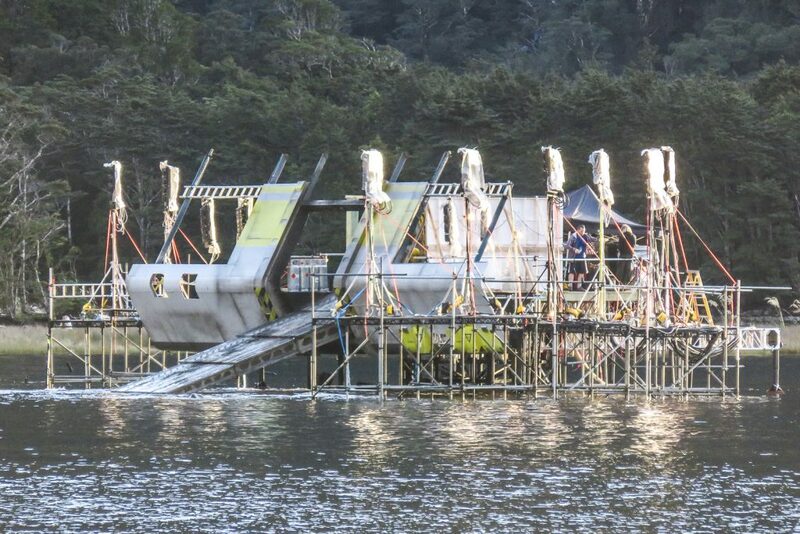 A number of excellent, scenic movies have been filmed here, including The Hobbit trilogy, The Lord Of The Rings trilogy, The Willow, X-Men Origins: Wolverine, and of course Alien Covenant. New Zealand’s popularity in the film industry is due to its impressive and highly diverse landscape. From the sparkling fields of ice on the glaciers to the lush valleys, there is something here for everyone. Each new destination that you reach during your tour of New Zealand will bring you to a different and unique landscape, emanating extraordinary beauty. While many people choose to travel by bus to Milford Sound, it is a far better idea to drive yourself. It is a four-hour drive from Queenstown to Milford Sound, with a single town half way between. To make your trip far more relaxed, book yourself two nights in the little town of Te Anau. This will cut your travel time in half on the day that you do your Milford Sound tour. You will also have more time to spend admiring the staggering beauty of the view when you arrive. The drive from Te Anau may be shorter, but that certainly doesn’t mean it has less to see. There are a plethora of excellent stops to enjoy along the way. If you’d rather not leave the vehicle, you’ll still be able to admire the stunning scenery that passes your window. One of the most significantly beautiful sites along this drive is Mirror Lake. This glassy-surfaced wonder reflects the towering mountain range behind it. The tranquillity of this place will leave you feeling refreshed and rested, making it the perfect stopping point for the two hour drive. For those of you with an adventurous spirit, you can do a hike along some trails that you find on your journey. 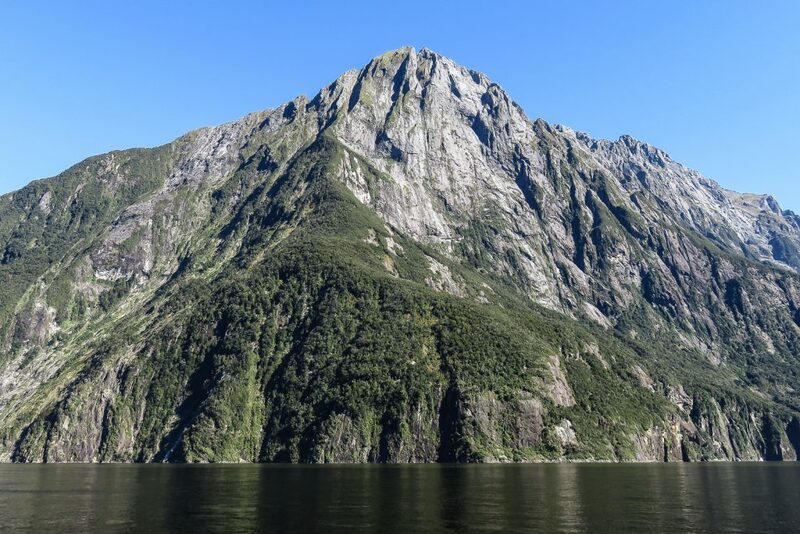 If you’d like to explore the area further, before visiting Milford Sound, then read more about the drive from Te Anau. A tour of New Zealand will take you through a number of different landscapes, each one more beautiful than the last. From the great slopes of volcanoes to the powdery slopes of snowy mountains and the sports that go along with them, New Zealand offers an unparalleled variety of destinations. 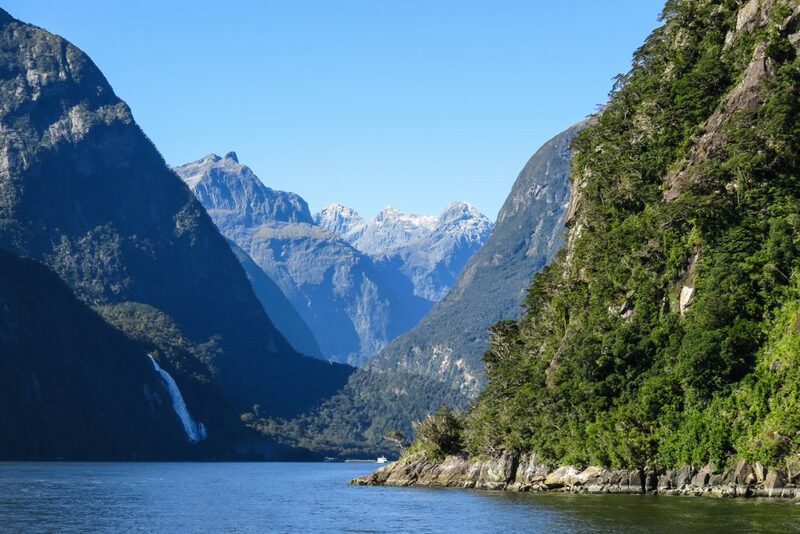 Taking a Milford Sound cruise will leave you with very fond memories of New Zealand. The fantastic view of rock submerged in water, with the incredible backdrop of Mitre Peak, displays a beauty that only Milford Sound possesses. Combining its beauty with a Milford Sound tour by helicopter, there is almost nothing more that one could ask for. Why go Whitewater Rafting in New Zealand? Great post! We are heading there right after New Years! We’ll be driving ourselves and stopping for a night in Te Anau on the way. 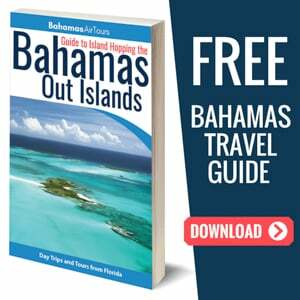 Do you have any boat companies you’d recommend using for the boat cruise? 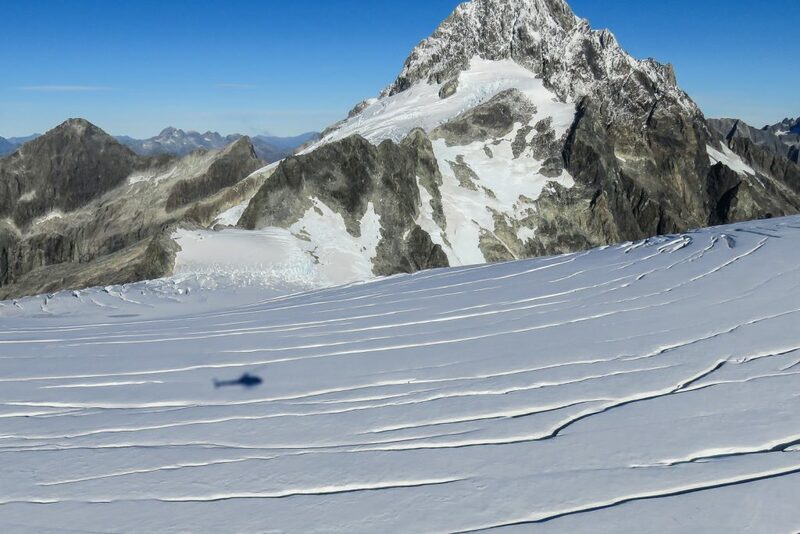 Hi Jocelyn, Yes try Mitre Peak cruises. They have smaller boats and get you right up close to the waterfalls. Also try and go early on your drive from Te Anau to Milford Sound and stay ahead of all the coach loads from Queenstown! Hi Mark, how we can book a cruise in Milford sound? I booked a tour with Mitre Peak Cruises, try searching for them! The Lord of the Rings brought me excitement about New Zealand that is why it is my gift to myself to travel to this marvelous place. I just cant help to imagine myself being on the place where my favorite movie is being filmed.